Bohdi Sanders – The Blood of My Enemies. “I did not put out any false credentials,” says Bohdi Sanders to Alan Goldberg on Facebook on February 13, 2019. Sanders’ books are all self-published through his Kaizen Quest imprint. Bohdi Sanders claims to be a 5th degree Black Belt in Shotokan Karate with over 30 years of martial arts training and experience. Using credentials from an unaccredited college to claim he holds both a Doctor of Naturopathy degree and a Ph.D. in Natural Health. Making false claims about his martial arts training, experience, and ranks. Bohdi Sanders Clayton College of Natural Health Diploma. 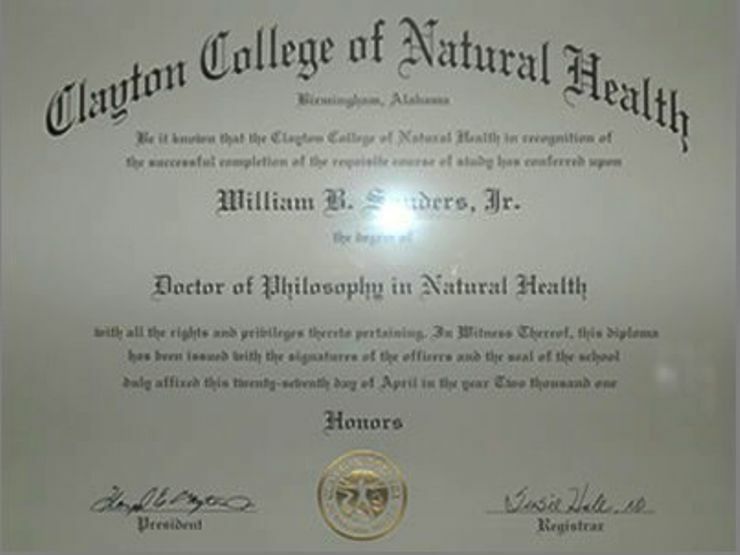 Sanders’ “doctorate” was awarded by Clayton College of Natural Health. Clayton College of Natural Health was a non-accredited American distance-learning natural health college based in Birmingham, Alabama, offering classes in various forms of alternative medicine . . Clayton College of Natural Health never held educational accreditation from any agency recognized by the U.S. Department of Education or the Council for Higher Education Accreditation. Clayton College did not hold any educational accreditation from any agency and was only licensed by Alabama Department of Post-secondary Education from 2003 to 2008. The school opened in 1980 and closed in 2010. On his website Sanders refers to his “Doctorate in Natural Health and Naturopathy” and his Clayton College diploma on his website shows him as a Doctor of Philosophy in Natural Health.15 A “Doctorate in Natural Health and Naturopathy” is common in the diet supplement and self-help industries and should not be confused with a “Doctor of Naturopathic Medicine” (N.D. or N.M.D.) which is a legitimate medical degree recognized in at least 17 U.S. states. …Furthermore, doctorate degrees from Clayton College are also recognized by state and federal organizations, such as public schools and government organizations. My degree has been recognized and accepted by the State of Colorado as a legitimate degree, and the coursework has been accepted for my pay scale and for my teaching endorsement. Clayton College was never accredited by any accreditation agency recognized by the state of Colorado or anywhere else, so Sanders’ assertion is not true. We contacted “Teresa” at the Colorado Department of Education licensing department (303-866-6600) and she confirmed that the degree from Clayton College of Natural Health cannot be used for licensing purposes in the state of Colorado. Degrees from Clayton are watch listed and considered fraudulent by nearly every state in the country and in many other countries where it is actually illegal to represent yourself as a “doctor” or “Ph.D.” with a Clayton degree. Sanders’ name appears on the following watchlist posted online by CredentialWatch.org: https://www.credentialwatch.org/non/clayton_graduates.shtml. 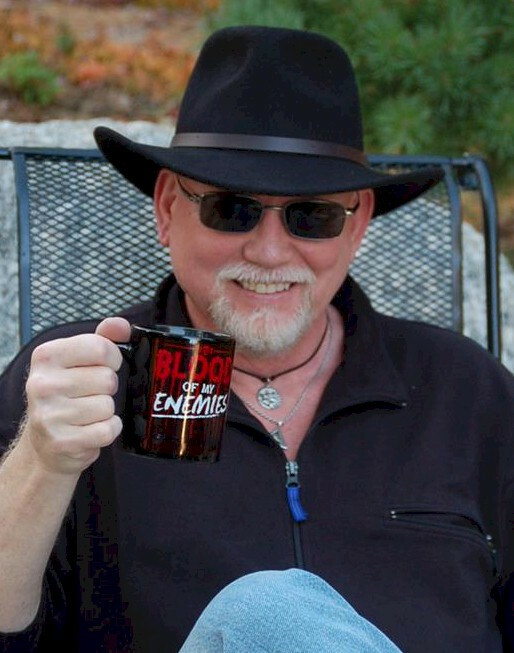 Bohdi Sanders is a writer, teacher, and martial artist. He has published several articles and has appeared on national radio programs. Bohdi is also an herbalist with a background in natural health, and is certified in the healing arts and energy work. He has trained in several martial arts, he has taught Shodokan Karate, and has done extensive research in wisdom literature. His writing focuses on how to live the lifestyle of the warrior through the teachings of ancient wisdom texts from across the ages, and from every corner of the earth. The wisdom from these texts, and the connection between them and the modern day warrior, is discussed on the Wisdom Warrior website. His new book, Warrior Wisdom: Ancient Wisdom for the Modern Warrior, will be in the bookstores soon. 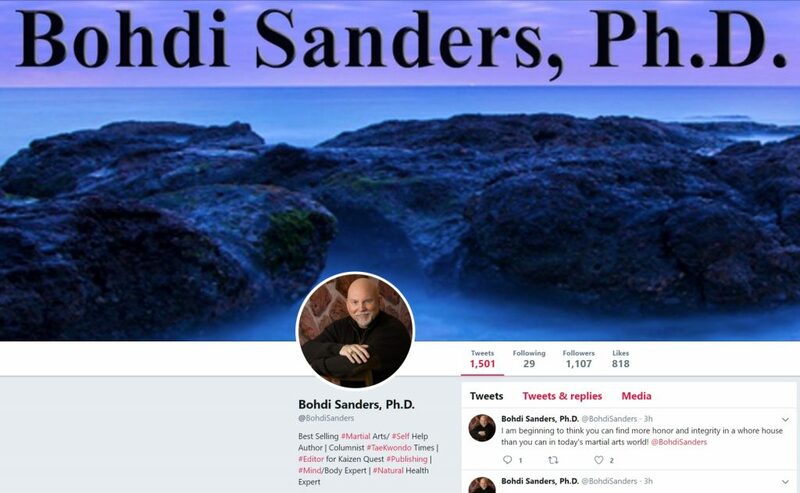 Bohdi Sanders has claimed at various times on his website, Amazon author page, LinkedIn page, and social media sites ranks from 5th degree Black Belt to 6th and then 10th degree Black Belt and training in a wide range of martial arts (ninjutsu, krav maga, jujitsu, etc.). Sanders has been unable or unwilling to provide proof of his training or progression through the ranks in Shotokan Karate. Requests that he post copies of his 1st, 2nd, 3rd, and 4th degree Black Belt certificates have been ignored, as have requests for references and names of instructors who can credibly vouch for his training and/or ranks. Bohdi Sanders Yellow Belt Certificate form Bob Allen. To date Bohdi Sanders has produce a Yellow Belt certificate awarded to him in 1984 by well-known karate instructor Bob Allen; a newspaper article originally published in the mid 1990’s in The Index (the Hermitage Missouri newspaper), about a youth karate program he had started through his position as a teacher in the local school district; and a single photo Sanders wearing a Black Belt from around that time. It is notable that in the newspaper article, Sanders claims membership in the World Black Belt Bureau (a well-known martial arts diploma mill) and American Bujinkan Dojo as his martial arts credentials. Sanders claims to have been awarded his 1st degree through 5th degree Black Belts by a 7th degree Black Belt and survivalist named William Jackson. Efforts to verify the existence of Jackson and a location/contact information have turned up nothing and Sanders has been unwilling to provide information that would allow his claim to be verified. Bohdi Sanders Black Belt and teaching statements made in 2014. Click on image for larger view. In response to this article, a credible reader provided the above screenshot from a Facebook private message conversation he had with Sanders in 2014. 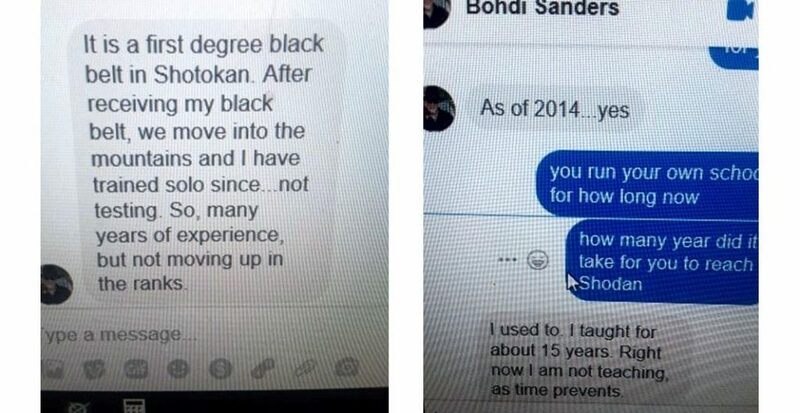 In this conversation Sanders claims to only be a 1st degree Black Belt in Shotokan karate while admitting that from 1996 (the year of his promotion to shodan) and 2014 he never tested and only trained “solo.” By September 1, 2014, Sanders would be claiming a 10th Dan and “Title of Hanshi” from the Extreme Budo Federation with future claims of having been awarded 5th and 6th dans yet to come. Bohdi Sanders home-made Go-Dan Certificate from “William Jackson”. 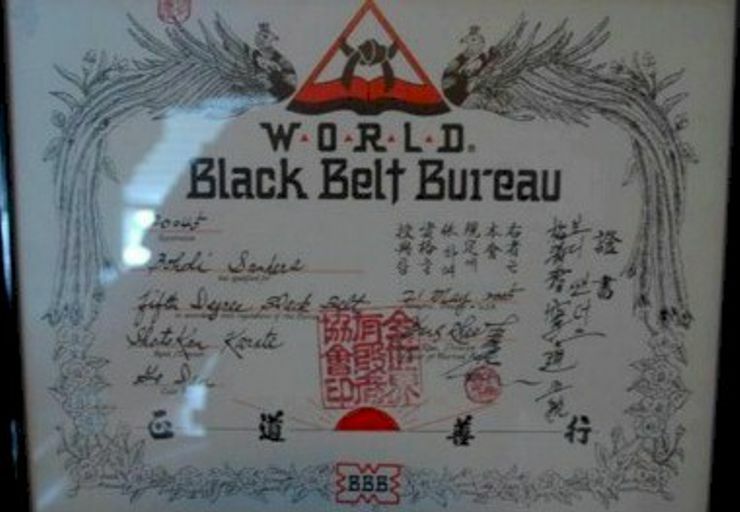 Bohdi Sanders 5th Degree World Black Belt Bureau certificate. 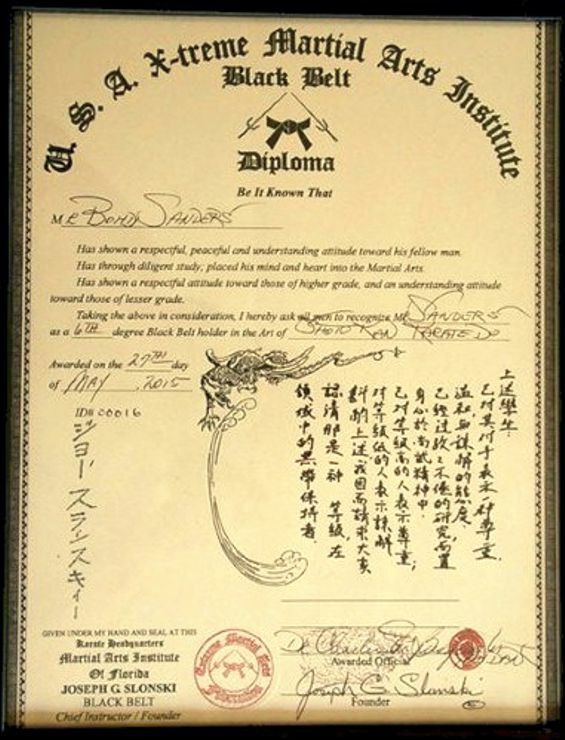 Bohdi Sanders 6th degree Black Belt certificate from Joseph Slonski. Click on the image for a larger view. Bohdi Sanders 10th degree Black Belt from the Extreme Budo Federation.Click on the image for larger view. “Dr. Bohdi Sanders is a multiple award-winning author of over 8 books on martial arts philosophy, self-help, and the science of living life to the fullest. His writing focuses on integrating universal wisdom, honor, and integrity into one’s personal life. He has won 9 national awards for his writing and his contributions to the martial arts. Dr. Sanders is also a renown martial artist with over 31 years experience and is also a Martial Arts Hall of Fame inductee. While his main martial arts experience is in Shotokan Karate, he also has experience in Ninjutsu, Jujutsu, and Krav Maga. In addition, Dr. Sanders has extensive training in the holistic arts. 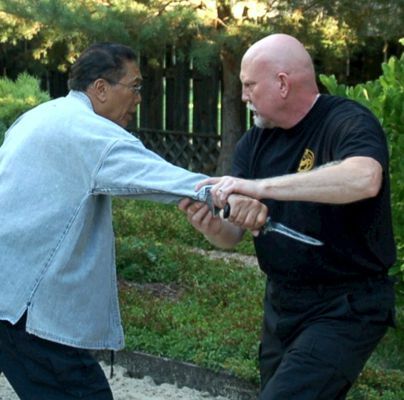 My official martial arts training began in 1984 under the instruction of Bob and Nikki Allen. Since that time I have had several different instructors, as we had to move around because of school and work. I earned my first black belt in Shotokan karate in 1996 under Shihan William Jackson and continued training with under his direction, up through the rank of Go Dan in 2005 which is also signed and certified by Cindy Jackson and Soke Richard Hallman. Note: The statement “up through the rank of Go Dan in 2005 which is also signed and certified by Cindy Jackson and Soke Richard Hallman” is false. Richard Hallman’s signature does not appear on the Jackson certificate and Sanders did not know Richard Hallman at the time he claims it was awarded. 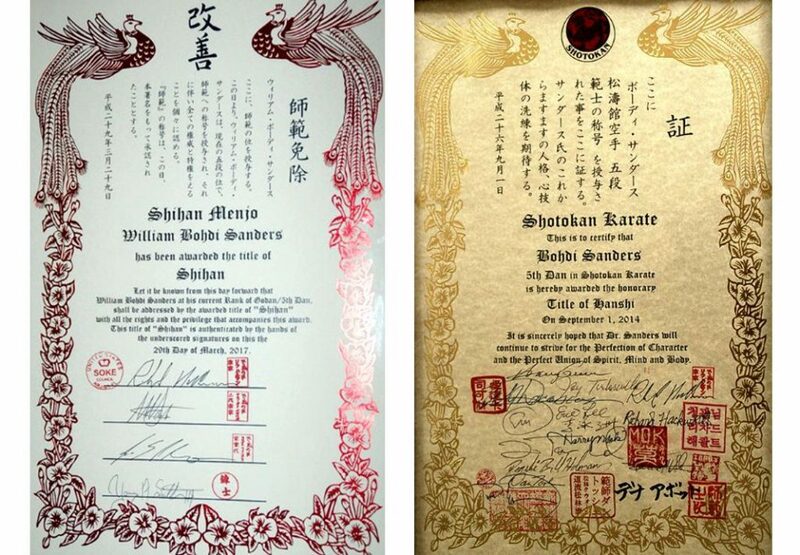 Bohdi Sanders Shihan and Hanshi Certificates. Click on above image for a larger view. As far as we can determine, this certificate did NOT exist before 2017 and was first posted on Sanders’ website on July 20, 2017. 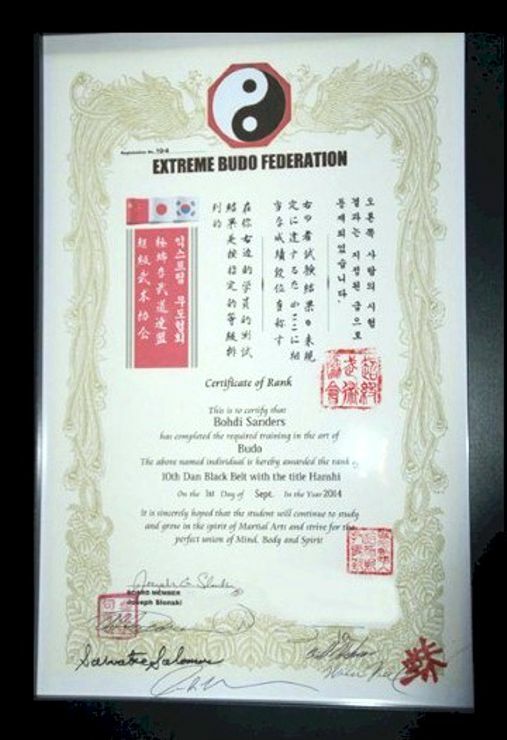 The “Hanshi Certificate” that was actually dated September 1, 2014 was the Extreme Budo Federation certificate that was stripped and disavowed by that organization. Apparently, the Sanders-fabricated certificate was intended (by Sanders) to somehow “replace” the rank and title certificate that had been taken away from him. This is a very strange sequence of events and activities – more like a self-promotion scheme – that doesn’t remotely resemble accepted or common standards for conferring martial arts ranks, titles, and honors. Beyond the above issue, this certificate has many problems. 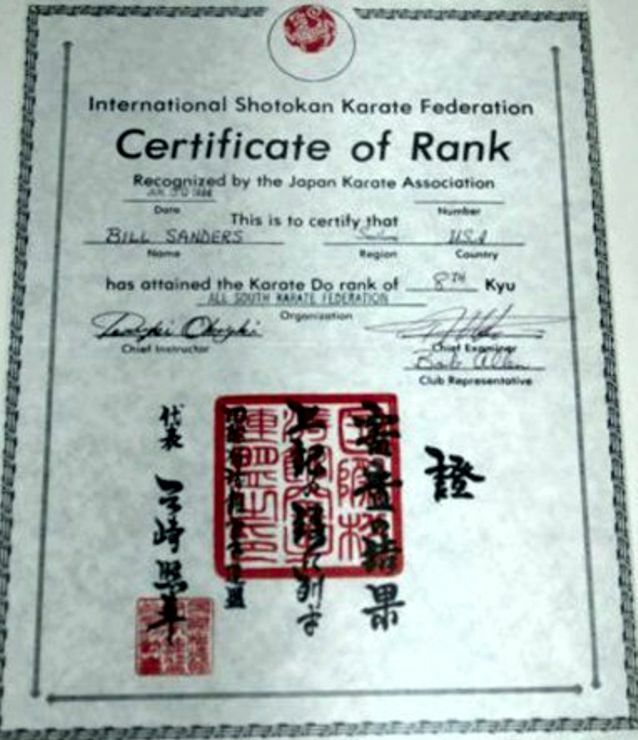 Contrary to what the inclusion of the Shotokan logo might suggest, Sanders is not formally affiliated with the Japan Karate Association or any recognized Shotokan group. The certificate is not issued by a martial arts governing body, association, or federation. While its design and wording might suggest otherwise, it is not a rank certificate. The certificate, created by Bohdi and mailed to each individual for their signature, is merely a proclamation signed by a group of Sanders’ acquaintances who trusted Sanders. These individuals are martial arts individual who Sanders has either worked with on book projects, met through his stint on the board of the Extreme Budo Federation, met at at hall of fame events, or has friended on social media. It should be noted that while the title of “hanshi” (along with the other Shogo titles “Kyoshi” and “Renshi”) IS a bestowed title, it would not be given to someone as low-ranked or inexperienced as Sanders (“hanshi” is typically reserved for 8th degree and above with 40 or more years of experience in their art). Regarding the “shihan menjo,” it should be noted that the title “shihan” is not typically recognized as a bestowed title (though its use is far from standardized from one organization to another, so this isn’t always the case). Though it gives the impression of being one, this certificate is not a rank certificate. A “Shihan no Menjo” is a teaching license used by some styles of Karate. This certificate itself is odd in that it doesn’t explicitly state an issuing authority, though it can be assumed that it is the “United States Soke Council” (a tiny group based in Indiana and established sometime around 2015 to sell memberships and issue “sokeships” and licenses 21) since two of the signatories are from that organization and Hallman uses his United States Soke Council seal on the document. 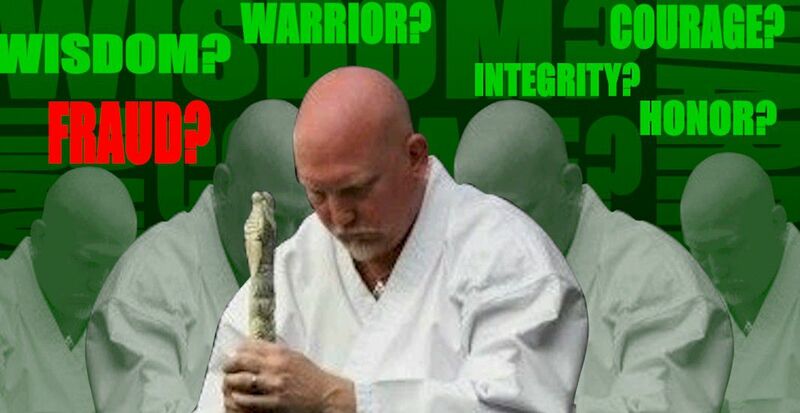 “Bohdi Sanders was not issued a Shihan certificate from the USSC! He is not a member and has never been a member. For the record, the Shihan Menjo certificate in fact does not state it is from the United States Soke Council, however, Richard Hallman is the United States Soke Council Vice President and he did affix his United States Soke Council seal to the document, possibly to imply that he derived his authority from the United States Soke Council. Further, the two of the four signatories on the document are United States Soke Council members (Richard Hallman and Stephen Barber) while the other two (Scot E. Philips and Young Arthur Smith III) apparently are not. 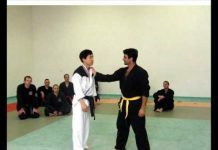 Bohdi Snaders claims title of Shihan. 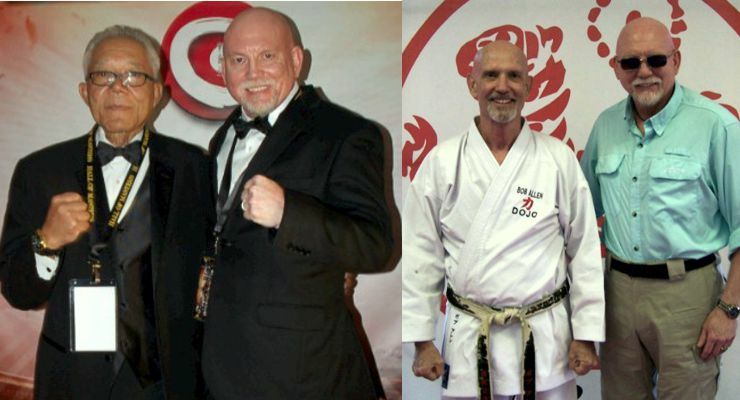 “It is always nice when other martial artists recognize your skills, talents, and contributions to the arts.I am honored to announce that I have been awarded the official title of SHIHAN, with all of the rights and privileges that accompany it, by Soke Richard Hallman. It is truly and honor for me and I want to respectfully thank you for honoring me with this title, Soke Hallman. This awarded title from completely unexpected. Soke Hallman spent several months doing background checks into every part of my credentials and reading my writings, books, and how I interacted with people. One day a got a call from Soke Hallman and he told me that he had been researching my background and my credentials, and asked for a copy of my GoDan certificate in order to verify it as well. I thought that he was probably checking me out because he had heard some of the false rumors and lies being spread about me. I have to admit, I was a little nervous sending anyone a copy of my GoDan certificate. I have never put sent it out or put it online before, but I sent it to him. Soke verified its authenticity, and translated the kanji for me. Then, out of the blue, I got a call one day and he informed me that I was being awarded the official title of Shihan. What an honor! Stephen Barber/10th Dan Nidai Soke USSC member. First, Hallman is not a Shotokan practitioner as Sanders claims to be. Hallman practices and certifies people in his own style, Aido Ryu Jujitsu. 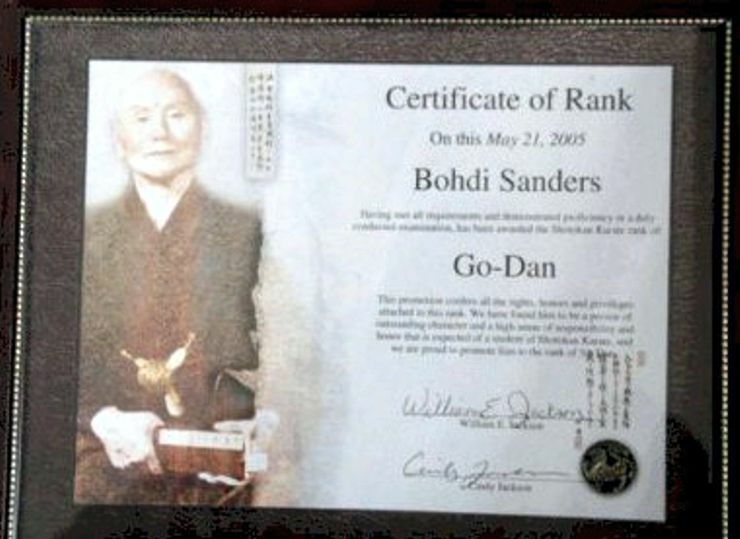 Sanders has never claimed to have trained under Hallman, or studied Aido Ryu Jujitsu (as far as anyone knows, they have never met face to face), therefore it would seem inappropriate for Hallman to issue a “Shihan Menjo” (teaching license – note that Sanders mis-spelled “menjo” as “menji” throughout) to Sanders. Second, Sanders’ statements in his bio and then the announcement above are contradictory. Elsewhere, Sanders seems to claim that Hallman “certified” the Jackson certificate, but here he references a go-dan certificate that no one has ever seen (the Jackson certificate has no Kanji to be deciphered). Where is this certificate that Hallman “certified” in order to justify issuing a Shihan Menjo to someone he has never trained with, who claims to be a 5th degree Black Belt in a different style altogether? Third, what would prompt Hallman to look into Sanders’ credentials? Sander’s version of events seems unlikely. It is known that the two men are Facebook friends and until recently, Hallman was almost a daily poster on Sanders’ social media sites. Richard Hallman has not been reached for comment at this time, however, efforts to reach him are underway. Details will be posted as the become available. 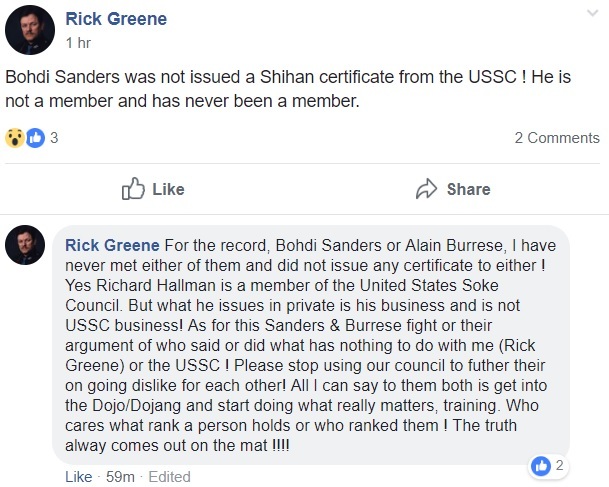 Since 2015, Bohdi Sanders has claimed that Hapkido instructor and martial arts author Alain Burrese is the author of the original article (posted under a pseudonym) that triggered the interest in, and scrutiny and exposure of, Sanders’ background. To date, Sanders has failed to produce credible evidence backing his claim and Burrese has consistently maintained that he did not author the articles any related forum posts. In retaliation, Sanders (with the help of others) has written numerous long articles attacking Alain Burrese, making many unsubstantiated and defamatory claims about Burrese’s military service and his career as an attorney, as well as attempting to discredit his martial arts credentials and accomplishments. These claims against Alain Burrese have all been proven to be false through credentials and military documents provided to Martial Arts Enterprises by Alain Burrese and through contacts with the Montana State Bar Association and other credible sources. I have deliberately removed the name of the analyst as he has a classified profile and has done the analysis for old time’s sake. Despite being fully aware of the report’s Indian origins, Sander’s strongly asserted on his website that it is “absolutely admissible in court” when in fact it is not admissible due to fact that is was produced outside of the United States by persons unknown who refuse to provide their name and credentials as a qualified handwriting analyst as is required in the United States. Even if the analysis had been done in the United States, it would have certainly been disallowed as it was performed by a personal friend of someone who has a well-documented bias and personal stake in damaging Alain Burrese’s reputation. 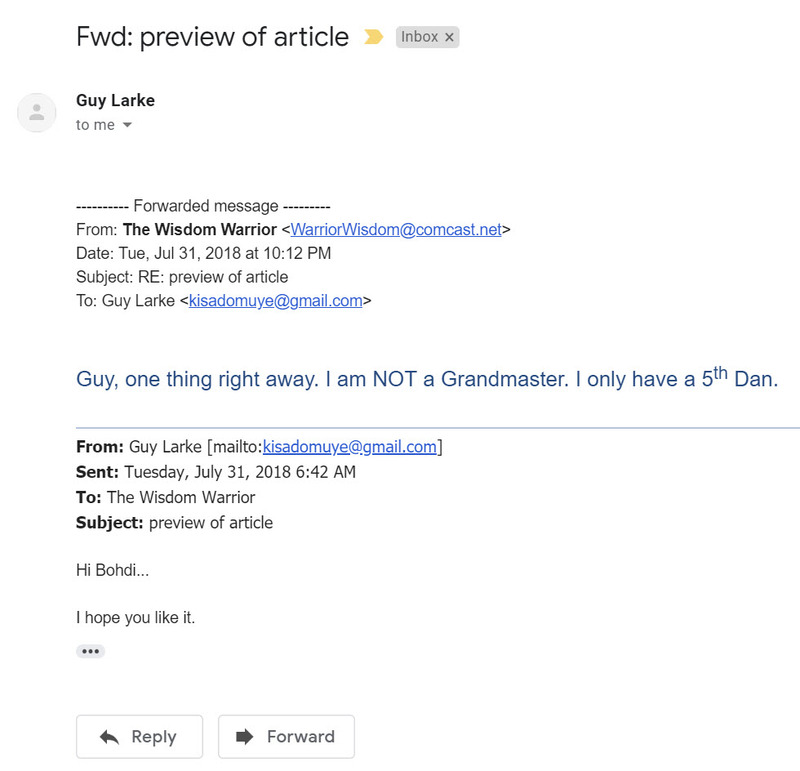 As of this writing, Martial Arts Enterprises has been able to determine beyond any doubt that Alain Burrese and the blogger who goes by the name “Lordus Sapiens” and wrote the article “Bohdi Sanders: Pseudo-Bushido and the Corruption of a Wisdom Warrior” as “MTTKDGUY” cannot possibly be the same person. 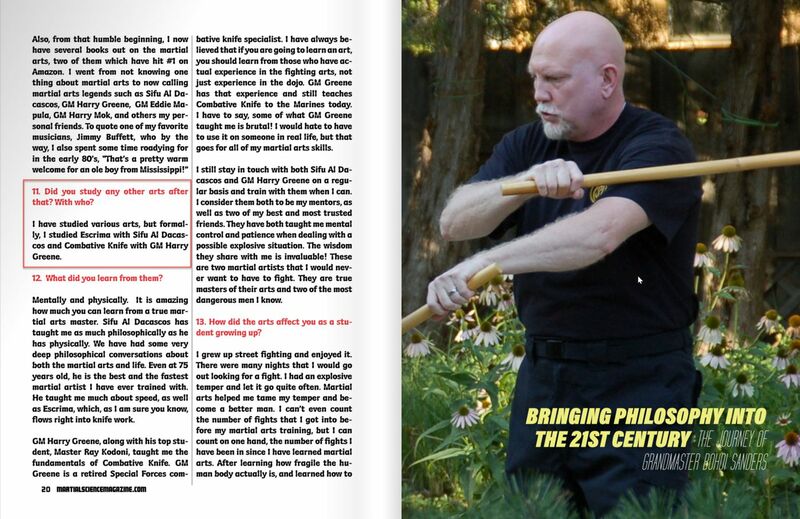 In August 2018 a long interview with Bohdi Sanders was published in Martial Science magazine. The interview is notable because it contains statements by Bohdi that contradict his previous claims regarding his martial arts background, as well as exaggerations and embellishments on his relationships with well-known instructors. Sanders discusses his experiences with Bob Allen, Al Dacascos, and Harry Greene at considerable length…especially considering just how limited his time with these instructors has been. 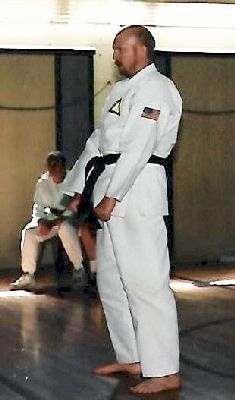 For example, the highest level he achieved with Bob Allen was a yellow belt – which in most schools represents a mere six months or less of training, which in Sanders’ case occurred 35 years ago in 1984 – but Sanders’ seems to try to give the impression that the two men share a much deeper connection than one might realistically think possible given the circumstances described. Did you study any other arts after that (referring to his experience with Bob Allen, which ended in 1984). With who? I have studied various martial arts, but formally. I studied Escrima with Sifu Al Dacascos and Combative Knife with GM Harry Greene. Al Dacascos and Bohdi “training” in Bohdi’s yard. It is known that Sanders has only ever been face-to-face with Al Dacascos a few times (all over the last couple of years while putting together Dacscos’ autobiography Legacy, at a hall of fame event, and perhaps one other time). The amount of “training” he could have done during these few short visits hardly seems enough to support the idea – one that Sanders aggressively promotes on his social media sites – that Dacascos is his “instructor” or that Sanders has anything approaching significant training in Escrima. In the Martial Science article, Sanders makes many unlikely claims regarding his training and relationships with well-known instructors. For example, according to Greene himself, Sanders never trained with GM Harry Greene. Bohdi’s claimed student-instructor relationship, and similar training claims, with Greene follows a similar pattern and turns out to be quite troubling in that when asked, GM Harry Greene responded that Sanders has never trained with him “formally” or otherwise though Sanders did train with one of Greene’s students, Senior Sensei Ray Kodani for about 20 minutes in the hall way at an event. Photo 1: Harry Greene and Bohdi Sanders, Photo 2 Bob Allen and Bohdi Sanders. As of this writing, Martial Arts Enterprises has not spoken to Bob Allen or Al Dacascos to determine the validity of Sanders’ claims, however, efforts are underway, and we will update this article when the results of our inquiries become available. Curiously, Sanders does not provide information regarding training for the 30-plus year period between leaving Allen’s school and meeting Dacascos in spite of making extensive claims on his website and social media sites for years. Starting in 1993 I began training with William and Cindy Jackson, where I trained in not only Shotokan, but survival skills as well. William was an avid survivalist and had a 7th degree back belt in Shotokan. I was blessed to have known and trained with him. I earned my first back belt in Shotokan karate in 1996 and continued training with their guidance up through the rank of Go Dan (5th degree black belt) in 2005. Ever since Sanders first mentioned the Jacksons, there have been efforts to verify their existence and requests that Sanders provide information that would allow his claims to be verified with them. To date, no one has been able to find or verify the existence of the William Jackson, and Sanders has refused to provide information that would allow for such verification. To date, no single credible person has come forward to vouch for Sanders’ training claims from 1984 to his emergence as the “Wisdom Warrior” sometime around 2008. 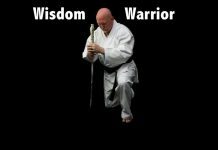 Bohdi Sanders Tweet about martial arts honor and integrity – 02-10-2019. Click on the image to read the tweet. When it comes to Bohdi Sanders, this just may be true. In this article, Sanders’ anthology series, Secrets of the Martial Arts Masters (1-3) is mentioned multiple times. It is not USAdojo.com’s intention to cast the contributors to the series — fine martial artists who have contributed much to the arts — in a negative light. This article in no way is intended to discredit those martial artists who have done much to earn our respect. It is meant to show the importance of integrity and honesty in the martial arts and how false and misrepresented credentials, titles, and ranks disrespect those whose blood, sweat, and tears have helped them reach the the legitimate rank they have obtained. William Bernhard Sanders changed his name legally to William Bohdi Sanders in 2015. Next articleFor Martial Arts Instructor Peter Grootenhuis, Quitting is Not an Option!